As part of the modernization of the thermal neutron spectrometers, a state-of-the-art thermal neutron instrument has been installed at the BT-7 thermal beam port. There is a choice of collimations in the reactor beam that bring neutrons onto a choice of PG(002) or Cu(220) 20 cm by 20 cm double-focusing monochromators. A velocity selector has recently been installed in the reactor beam to suppress unwanted neutrons and a PG filter is also available. The sample stage incorporates an independent magnet axis in addition to the usual motorized sample orientation and rotation angles. The analyzer and detector system is housed in a single unit on air pads. The analyzer provides horizontal focusing capability, or it can use the crystal array coupled with a position-sensitive detector to allow the simultaneous collection of data over a range of (Q,E), or it can use a choice of different conventional collimators, all remotely and under computer control. The analyzer/detector system is designed to be self-contained so that it can be easily interchanged with a different style of analyzer as new systems are developed. Guide fields are incorporated throughout the instrument to enable polarized beam operation with optically-pumped He3 polarizers. 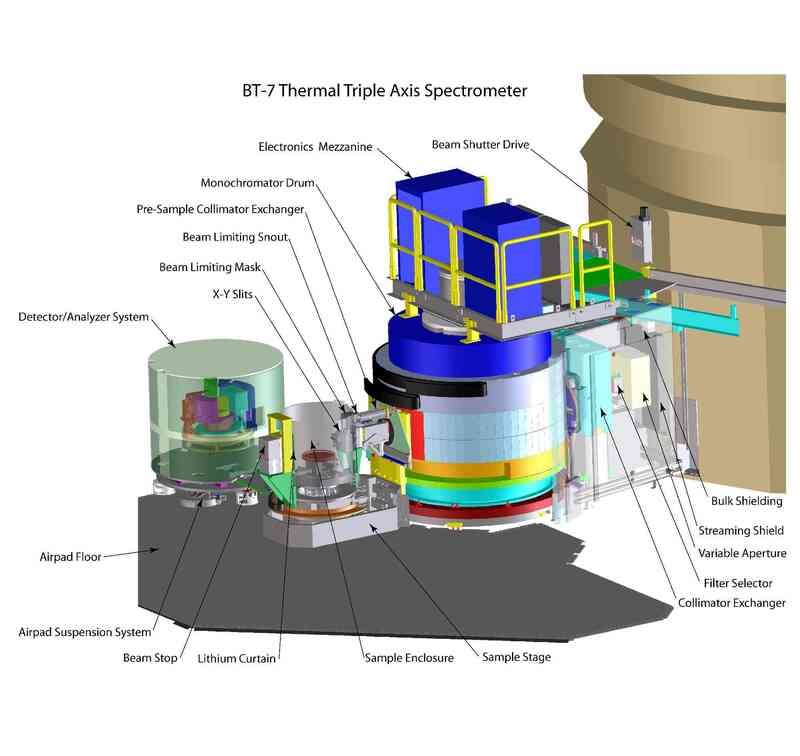 BT-7 Instrument Publication: Please reference the following article in publications: Double Focusing Thermal Triple Axis Spectrometer at the NCNR, J. W. Lynn, Y. Chen, S. Chang, Y. Zhao, S. Chi, W. Ratcliff, II, B. G. Ueland, and R. W. Erwin, Journal of Research of NIST 117, 61-79 (2012).